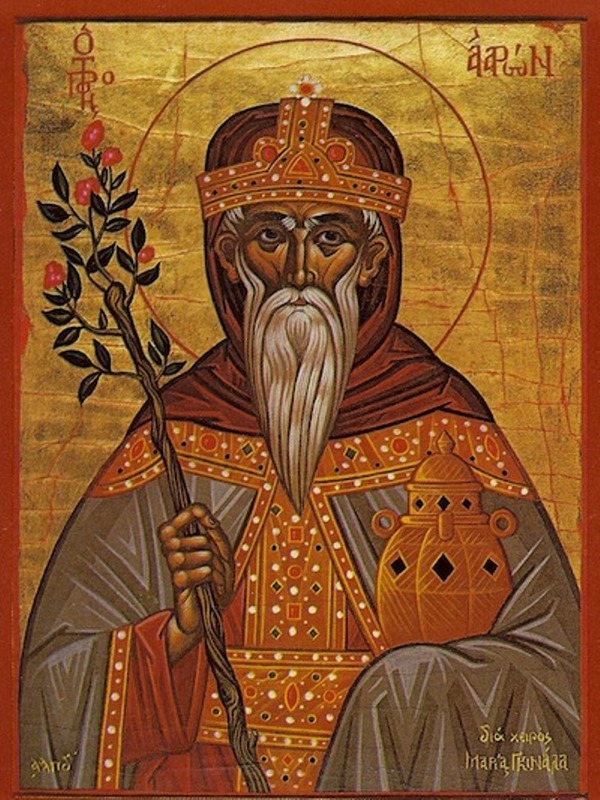 The Holy High Priest Aaron was the elder brother of the Holy Prophet Moses. He was appointed by God to serve as the spokesman of Moses before the people of Israel, and also before Pharaoh, in Egypt. Afterwards, in the wilderness, he was called to the ministry of the high priesthood, as narrated in the books of Exodus, Leviticus, and Numbers in the in the Old Testament. The name Aaron means "enlightened." The Righteous Aaron was the son of Amram and Jochebed, and the elder brother of the Prophet Moses the God-seer, and also of the Prophetess Miriam. He was a direct descendant of Levi by both parents. God called him “the Levite” in Exodus 4:14, when He appointed Aaron to be the spokesman for Moses, who was “slow of speech,” before the people. Later, he would also speak on behalf of Moses before Pharaoh in Egypt (Ex. 4:30; 7:2). Aaron was married to Elisheba, the daughter of the Prince of Judah (Ex. 6:23), who bore him four sons. Moses was eighty years old and Aaron was eighty-three when they spoke to Pharaoh and asked that the Hebrews be released from their slavery. The Lord told Moses that Pharaoh would ask them for a miracle, and that Aaron should throw down his rod before him, and it would become a serpent (Ex. 7:9). When Pharaoh would not allow the Hebrews to leave Egypt, God told Moses to have Aaron stretch forth his rod over the Nile River, and it would turn to blood. Following a succession of plagues, Pharaoh relented and let the people go, then Moses led them on their long journey to the Promised Land. In chapter 17 of Exodus, the Hebrews fought Amalek in a battle at Rephidim. Moses stood atop a hill with the rod of God in his hand. As long as he raised his hand, the Hebrews prevailed, but when he became tired and lowered it, Amalek prevailed. Aaron and Hur sat Moses on a rock and held up his hands, one on each side. This was a prefiguration of the suffering of Christ, because the arms of Moses formed a cross. In the Greek Septuagint, the names Aaron and Hur begin with the letters Alpha and Omega, another reference to Christ (Revelation 1:8). The books of Exodus, Leviticus and Numbers maintain that Aaron received from God a monopoly over the priesthood for himself and his male descendants (Exodus 28:1). The family of Aaron had the exclusive right and responsibility to make offerings on the altar to the God of Israel. The rest of his tribe, the Levites, were given subordinate responsibilities within the sanctuary (Numbers 3). 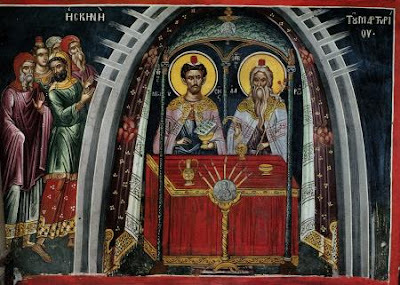 Moses anointed and consecrated Aaron and his sons to the priesthood, and arrayed them in the robes of office (Leviticus 8; cf. Exodus 28-29). He also related to them God's detailed instructions for performing their duties while the rest of the Israelites listened (Leviticus 1-7, 11-27). Aaron and his successors as high priest were given control over the Urim and Thummim by which the will of God could be determined (Exodus 28:30). God commissioned the Aaronide priests to distinguish the holy from the common and the clean from the unclean, and to teach the divine laws (the Torah) to the Israelites (Leviticus 10:10-11). The priests were also commissioned to bless the people (Numbers 6:22-27). When Aaron completed the altar offerings for the first time and, with Moses, "blessed the people: and the glory of the Lord appeared unto all the people: And there came a fire out from before the Lord, and consumed upon the altar the burnt offering and the fat [which] when all the people saw, they shouted, and fell on their faces" (Leviticus 9:23-24). In this way, the institution of the Aaronide priesthood was established. In chapter 32, Aaron fell into temptation when Moses went up on Mount Sinai to receive the Commandments. Since Moses was taking a long time, the people grew restless and asked Aaron to make them a golden idol in the form of a calf so that they could offer sacrifices. He gave into them, and Moses was angry when he returned and saw them dancing and singing before the calf. He threw down the tablets on which God had written the Ten Commandments, and then he burned the golden calf and ground it to powder. He scattered the powder in water, and he made the people drink it. When Moses asked those who were on the Lord”s side to gather around him, the Levites came to him. He ordered them to take their swords and slay their sons, companions, and neighbors. About three thousand people were killed that day. Later, Aaron and Miriam criticized Moses for marrying a Cushite woman (Num. 12:1). God was angry with them, so He punished Miriam with leprosy. She was healed by God seven days after Moses interceded for her. According to Numbers 16-17, a Levite named Korah led many in challenging Aaron's exclusive claim to the priesthood. When the rebels were punished by being swallowed up by the earth, (Numbers 16:25-35), Eleazar, the son of Aaron, was commissioned to take charge of the censers of the dead priests. And when a plague broke out among the people who had sympathized with the rebels, Aaron, at the command of Moses, took his censer and stood between the living and the dead till the plague abated (Numbers 17:1-15, 16:36-50). In chapter 17 of Numbers, the people murmured against Moses and Aaron, so God commanded that the leaders of the twelve tribes should have their names inscribed on their rods and placed in the tent of testimony. One would be chosen to make the people cease their grumbling against Moses and his brother. Aaron”s rod bloomed miraculously in the tent of the testimony, to show that he had been chosen for this purpose. Aaron, like Moses, was not permitted to enter Canaan with the Israelites because the two brothers showed impatience at Meribah (Kadesh) in the last year of the desert pilgrimage (Numbers 20:12-13), when Moses brought water out of a rock to quench the people's thirst. 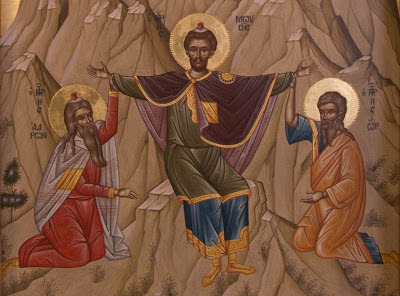 Though they had been commanded to speak to the rock, Moses struck it with the staff twice, which was construed as displaying a lack of deference to the Lord (Numbers 20:7-11). There are two accounts of the death of Aaron in the Pentateuch. Numbers says that soon after the incident at Meribah, Aaron with his son Eleazar and Moses ascended Mount Hor. There Moses stripped Aaron of his priestly garments and transferred them to Eleazar. Aaron died on the summit of the mountain, and the people mourned for him thirty days (Numbers 20:22-29; compare 33:38-39). The other account is found in Deuteronomy 10:6, where Aaron died at Moserah and was buried. There is a significant amount of travel between these two points, as the itinerary in Numbers 33:31–37 records seven stages between Moseroth (Mosera) and Mount Hor. Aaron was 123 at the time of his death. One of the descendants of Aaron was Saint John the Forerunner and Baptist, together with his parents Zechariah and Elizabeth. 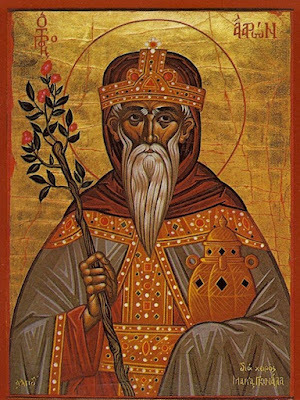 Aaron is also commemorated with other Old Testament saints on the Sunday of the Holy Forefathers, the Sunday before Christmas.